Though my memory of Nier is very patchy I do have a very fond spot for it. Over the years since it's release it has become something of a cult classic so I feel pleased that I fell in love with it long before that particular bandwagon was created. Nier was an offshoot of the Drakengard series of video games (that I have never played, though I do own the first one), it took place in the same game universe but was mostly unrelated. Nier: Automata too takes place in the same universe as those games, again it is only tangentially related. Hundreds of years in the past aliens invaded Earth and brought with them a deadly robotic army. This army virtually wiped out humanity and in desperation the survivors fled the planet and headed to the moon. It is from the moon that an army of androids were created to head back and reclaim the Earth from the robot hordes, and drive out the aliens. 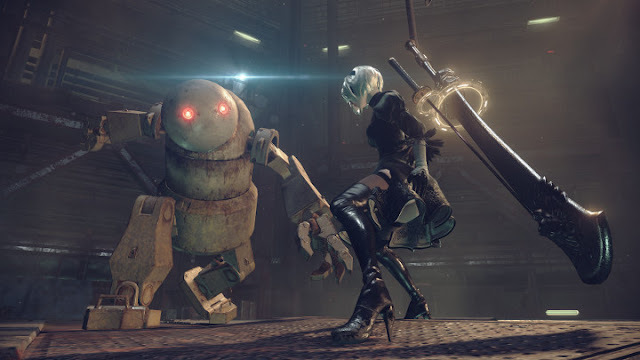 The game begins with the war having continued in a stale mate for hundreds of years, you play as 2B; a YoRHa soldier android who along with her support 9S has been sent down to the planet to establish contact with a resistance group stationed in a large ruined city. To say much more would ruin the surprises so I will leave it at that. 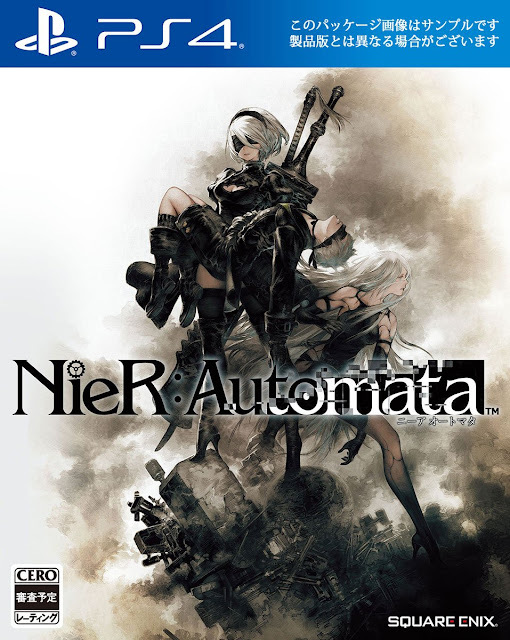 Nier: Automata is an action RPG that sees you in a medium sized post-apocalyptic open world completing quests for friendly characters you come across, while investigating the mystery of who is really behind the robotic army, and why so many once hostile foes are seemingly becoming self aware and no longer wishing to fight. From the moment this game was first announced I knew I wanted it, the demo a few months back only cemented that fact. The series is known for it's depressing storylines and the way it plays with player expectation, it is good to see those factors once again in abundance here. Automata is mainly in third person, though at times the levels morph into 2D sections, while a hacking mini-game that plays like an overhead twin stick shooter crops up very regularly. In general combat you are armed with both melee weapons, as well as a support drone that fires projectiles. The enemies in turn both attack up close and from far away. There are a couple of different characters you play as, each with a slightly different feel to their move sets. 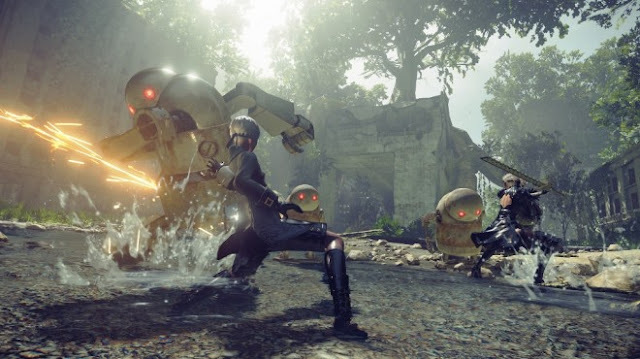 For example 2B has access to two weapons at once while 9S is strongest when he is hacking into enemies to cause them to explode, come under your control, or join your side. New weapons can be brought from shops and found hidden in the levels, they can be upgraded, and they can be switched up to make a large amount of different combinations. While most the game is played like a traditional 3rd person adventure game at many times it turns into a scrolling shoot em-up that sees you piloting a mech as you battle flying robots in what at times becomes a bit of a bullet hell. I loved how competent these sections where, and the great way the game transitions into these sections. One stand out moment comes late in the game when you take it in turns to switch between two different characters fighting their own bosses, one character fighting traditionally, the other in the distance flying up the screen like a classic arcade game. The plot is very involved and convoluted and is pretty clever in how it plays out. 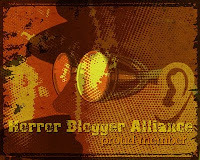 The over arching theme is of self awareness and what it means to really be alive. There is a huge divide between the androids and the robots, with 9S and 2B frequently treating the robots like they are just machines, yet all too often are confronted with the reality that maybe they are not so different, and that their lives are just as important. Side quests on paper are pretty dull, usually you get tasked with travelling to a location, collecting some items, then travelling back to the quest giver. It is the details that make these so compelling though. The story is very bleak and hopeless, this is reflected in the characters. Many of the robot side quests for instance end in suicide as they realise how pointless their existence are. Many of the androids side quests result in memory wipes with them unable to cope with the intense negative feelings they are experiencing due to the harsh world they inhabit. A lot of the time you are forced to confront just what it is your actions are doing. Nier was known for it's after credits additional reasons to play. Here this is ramped up to 11. It might be a spoiler for people but here goes; the first time I finished the game was around the 16 hour mark, yet beginning the game again after this resulted in me playing as a new character seeing things from a different perspective, and gaining new side quests. Also any side quests already completed stayed completed on this new run. Complete the game a second time and the last third of the game opens up, an even more sorrowful and depressing third that never failed to make me feel bad about everything in the game, and at one point made me tear up! So my overall completion time was around 36 hours which is not bad for a game such as this. The locations are pretty interesting encompassing a variety of different areas such as desert, abandoned factory, forest, theme park, and city. The main story missions are where the best paced sequences happen, making the most of the locations. The mission in the theme park has you riding a roller coaster set against a beautiful fantasy castle with fireworks exploding around you, the forest castle on the other hand turns the game into a Metroidvania style side on section. These missions are all so fun due to the story reasons. Whether it's fighting through a small army of robots decked out in fantasy gear in order to get to their King, or surviving the brutal aftermath of a suicide cult the missions are never anything short of epic. This is backed up by an awesome soundtrack, lots of choir singing and chanting really help make this dead land seem like one steeped in history, even some of Nier's music is revisited. The main enemy type are robots that resemble children's wind up toys, there are a lot of different variations and their clothes and weapons vary from area to area. In the desert for example they are decked out with capes, in the amusement park the robots resemble clowns, later on there are even zombie robots! Bosses are frequent and for the most part are huge hulking machines, the Goliath class ones are as tall as skyscrapers and in Shadow of the Colossus style twist you can physically climb your way up these beings. 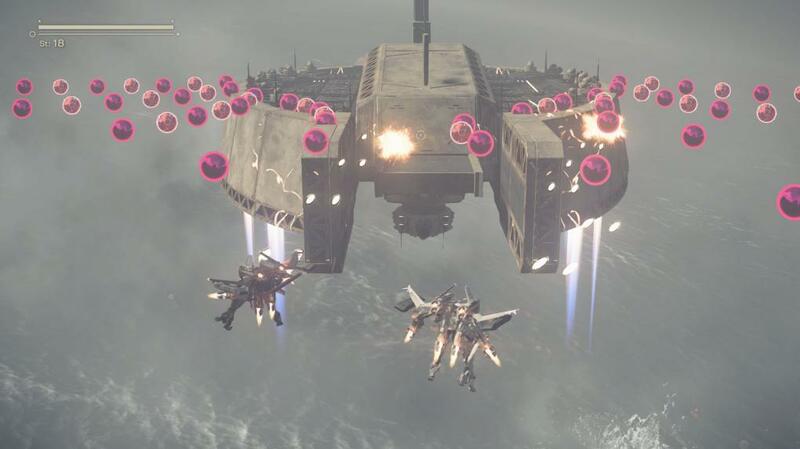 By the games end these bosses had repeated quite a bit, but fitted in tonally with the look of the robot army. Combat is by Platinum and it shows, you have light and heavy attacks you can chain together, while dodging at the last moment from the sign posted attacks results in a brief moment of invincibility and the option to do a strong counter attack. 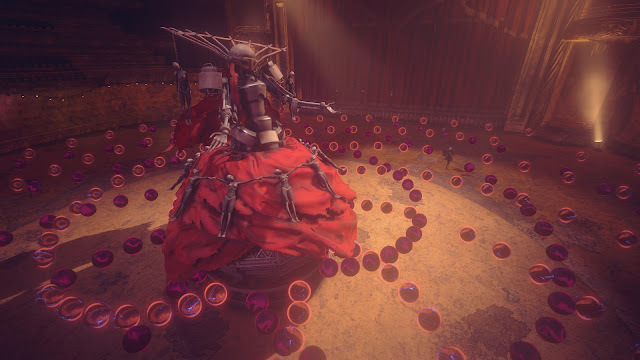 Nier: Automata is a forever unravelling puzzle box, it frequently opens up to present more and more questions, and more and more game world (that can be swiftly traversed by warp points). The story just gets bigger and bigger, especially on the amazing second and third play-throughs. While the game does look nice, it did reminded me ever so slightly of a more polished Playstation 3 game, the open world is certainly large but there isn't that much to do in it, while the side quests do give interesting pay-offs, yet the variation of what you are asked to do is pretty basic. It would have been nice if the side missions could have even half matched the excitement of the main missions. I seem to say this a lot lately but Nier: Automata stands alone in the way it is all set out. It may not be to everyones tastes but it is certainly something different from the norm, with an affecting story that shows genuine intelligence.